The temple of Apollo Zoster in Vouliagmeni (Attica). The peninsula of Cape Zoster, now called Mikro Kavouri “protects the modern yacht harbor and bathing beaches of Vouliagmeni. Near its base is the ‘laimos’, the low, sandy neck of land on which stood the temple of Apollo Zoster and other near-by ancient buildings. From the ‘laimos’ southward the peninsula rises to form rocky peaks. Immediately south of the ‘laimos’ and the temple of Apollo is a wooded hill now belonging to the Astir beach and resort which has grown up on the ‘laimos’. In 1958 and 1959, when development work was being done for the touristic establishments now found on the peninsula, the Superintendent of Antiquities, Mr. E. Mastrokostas, made emergency excavations and uncovered a number of antique remains including those of a ‘prehistoric fort’ on this wooded hill”. This is a description written by James R. McCredie in 1966 (Fortified Military Camps in Attica, Hesperia Supplement XI, ASCSA, Princeton/New Jersey, p. 30). Now, the Central Archaeological Council has declared the area an archaeological site, as concerns were expressed about the fate of the monuments, since the Astir Palace hotel is on sale, through the Fund for the Development of the Private Property of the State (TAIPED). One of the most important monuments, on the middle tongue of the ancient Cape Zoster, is the Temple of Apollo Zoster, founded in the 6th century BC. As for the name “Zoster”, Pausanias believed that in this location Leto, who was pregnant by Zeus, loosened her gilt belt, or zoster, as she was being chased by an angry Hera. Leto believed that she was about to give birth to the twins known as Apollo and Artemis. The temple was uncovered when children from the Vouliagmeni Orphanage playing at the beach (the Astir Beach) over the ancient temple that was buried in the sand, found a piece of polished marble with an inscription on it. Excavations were undertaken by the archaeologists K. Kourouniotes and M. Pittidis during 1926-7. The temple is of simple structure and moderate size. The ‘nave’, i.e. the main section of the temple, has dimensions of 10,8 m x 6 m, and its entrance faces the East. Within the newly declared archaeological site several ancient remains of different historical periods are located. 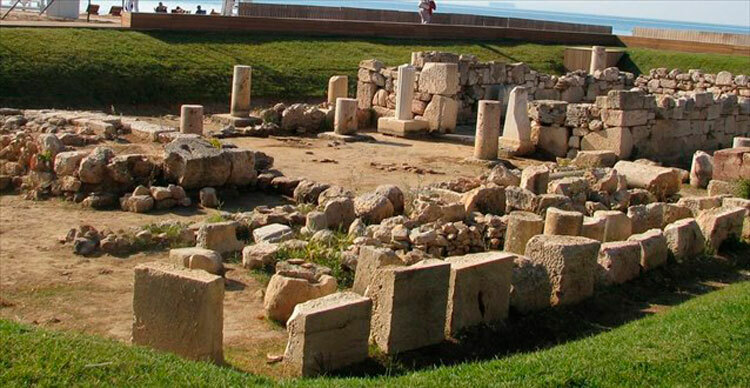 Apart from the Temple of Apollo Zoster, there are a) Early Helladic antiquities (houses and fortification walls), which came to light on the southeastern elevation of the “laimos” peninsula, and the Hill of the Muses, which sit within the premises of the Asteras Hotel, b) Famous monuments of the area, as the Hieratic House, which lies within the municipal parking lot, and c) Two circular towers of Classical period, one within the Orphanage and the other in Okeanida.